Let's face it. Remanufactured Laser Toner Cartridges have a terrible reputation. We've all heard stories of massive leaks and damaged printers. What you might be surprised at though, is that CCS doesn't like common remans any more than anyone else! We spend a lot of time educating potential customers about the difference between CCS's Renewed Cartridges and common remans. Take a moment and learn for yourself why common Reman's don't work, and why CCS's Renewed Cartridges DO! As one of the most experienced US cartridge remanufacturers, CCS respects the precise and complex engineering of OEM cartridges. In order to preserve the structural integrity of the cartridge, CCS disassembles them by hand rather than sawing them in half. This foundational process alone practically eliminates the leaks and streaks commonly associated with remans. Most common Reman processes involve sawing the cartridge in half, which destroys the structural integrity of the OEM casing (aka: core). Although this industry-wide practice greatly reduces costs, it does not allow for perfect realignment and it creates a weak spot in the cartridge that is vulnerable to printer torque. 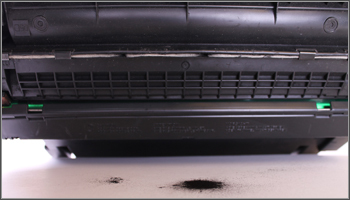 This makes common remans much more likely to cause streaks, leaks, and printer damage. The clips that you see on the right-hand cartridge up above are brand new. This picture shows what can happen as the printer torques the cartridge with each print. 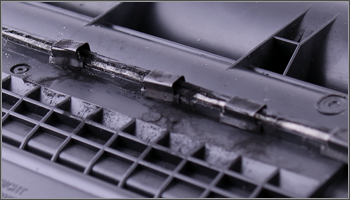 The clips can become loose and spill toner into the printer. What a mess! This cartridge is an example of a "Drill and Fill" remanufacturing process. 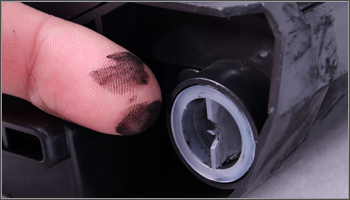 Drill and Fill is exactly what it sounds like: A hole is drilled into the cartridge, old toner is poured out, new toner is poured in to fill it back up, and a plug is put into the hole. In this case, the toner was leaking straight out of the box! This cartridge shows what can happen when the clips fall off. Not only are there now two clips lost somewhere inside the printer, but toner is actually POURING out of the cartridge! An even bigger mess!